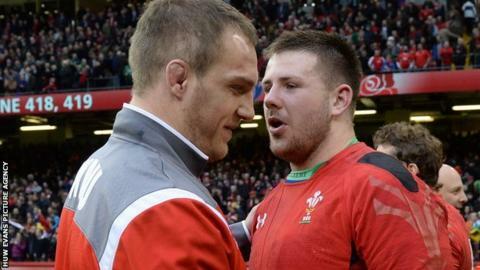 Wales' record appearance holder Gethin Jenkins will not play at the 2019 World Cup, says coach Warren Gatland. However, the New Zealander said he still expected Jenkins to play a big part in this season's Six Nations. Gatland said the appointment of referee Jerome Garces influenced his selection of Rob Evans at prop over Jenkins, 35, for Sunday's opener in Ireland. "We've spoken on a few occasions during the World Cup about potentially what happens to him," added Gatland. "Those discussions have been positive in making sure we respect what he's done for Welsh rugby." Gatland says he has also spoken with the 119-times capped Jenkins about the need to nurture a long-term replacement. "He knows he's not going to get through to 2019 and we've spoken about how do we manage the process where we bring someone on as a replacement, and his potential exit strategy as well." Jenkins, who made his debut for Wales against Romania in 2002, has also played five Tests for the British and Irish Lions. "He's a professional, he's been around a long time and I have no doubt that when he gets his opportunity he will come on and perform," Gatland added. Gatland admitted he had opted for three-times capped Evans ahead of Jenkins with Garces' refereeing style in mind. Jenkins played at prop when Frenchman Garces penalised the Welsh front row in two matches against England in 2015. "That was part of the conscious decision in terms of that selection," said Gatland. "He's tough at scrum time. He did penalise us a few times, but we were very happy with his control of the game. "And I think at the moment, from the performances that we've seen recently, he and Nigel Owens are definitely the top referees in world rugby." Jenkins' omission was the big surprise in Gatland's selection, which sees four changes to the team who lost to South Africa in the quarter-final of the 2015 World Cup. The return of centre Jonathan Davies was expected, but Justin Tipuric's inclusion on the open side, with captain Sam Warburton switching to the blind side in place of Dan Lydiate, was not predicted. Tom James returns on the wing, five and a half years after his last international appearance, ahead of Alex Cuthbert. Sonja McLaughlan presents a preview of the 2016 Six Nations Championship. Guests include Wales forward Ryan Jones and ex-England fly-half Paul Grayson (tonight, 1900 GMT, Radio 5 live).